Apple has seen fit to announce that it will open a new retail store soon at the Liberty Square or Piazza Liberty in Milan, Italy. 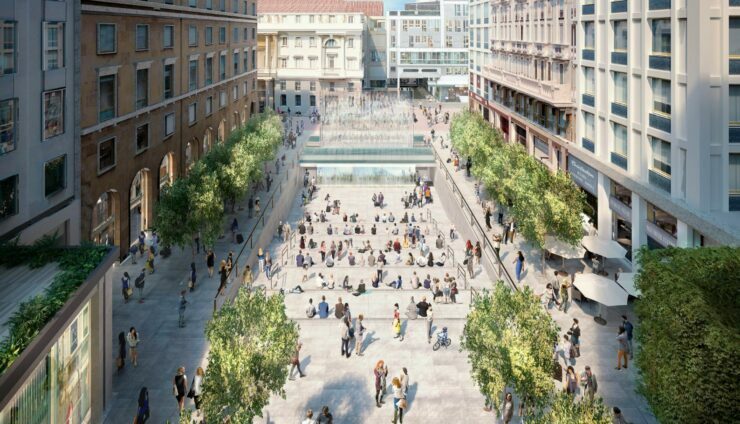 As it was previously revealed in the city planning documents earlier this year, the Apple Piazza Liberty Store will be situated completely below the outdoor amphitheater. So let’s get down and see some more details on Apple’s plans to open a new retail store in Milan, Italy. As for the store itself, the sales floor will be accessed through walking down the stairs. Moreover, the staircase itself will be situated between two waterfalls. This waterfall will be part of the larger fountain. However, for those not willing to use the staircase, an elevator will also be available. It will be a square full of ideas. We are incredibly happy to be in the center of Milan, a town that for centuries combines creativity and innovation. In the coming months we will work to give you a new Liberty Square: an open space for everyone to take a break, meet with friends, discover new interests. Apple is in the works to open a new retail store in Milan, Italy in partnership with the architecture firm, Foster and Parents. The architecture firm has aided the Cupertino giant in developing the most significant retail spaces around the world. In addition to this, the firm has also helped Apple design its new Apple Park headquarter. The store is there but you do not see it. Thanks to an original architectural solution, it is hidden beneath the cozy outdoor amphitheater. It will be the perfect place to share your passions, discover new ones and deepen your skills. You enter the store passing through two tall walls of water forming a great fountain, a tribute to traditional Italian squares. The new retail store will be called Apple Piazza Liberty and it will be located at Piazza del Liberty, 1-20121 Milano. The iPhone-maker is reportedly paying the city about €768k ($843k) to compensate the reconstruction of the square after the store is completed. In addition to this, the company will annually pay €127k ($140k) for using the square. However, at this point in time, the opening date has not yet been revealed. The company’s retail chief Angela Ahrendts wants Apple Stores to be more of a place for gatherings, a place where people could meet instead of just plain simple retail stores. This is it for now folks. What are your thoughts on the new Apple retail store opening soon in Piazza Liberty in Milan, Italy? Share your views with us in the comments.